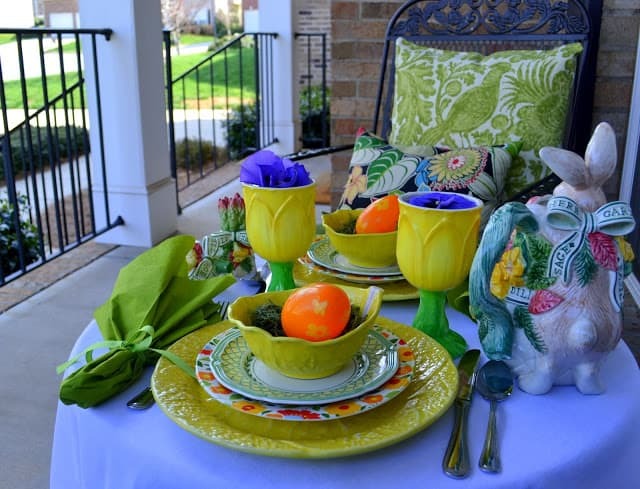 Wednesday was such a beautiful day that I couldn’t resist celebrating the official imminent arrival of Spring by setting up a little table for two on the front porch. I enjoy sitting out on my Easter-fied front porch where I can watch the kiddos at play and wave at my neighbors. 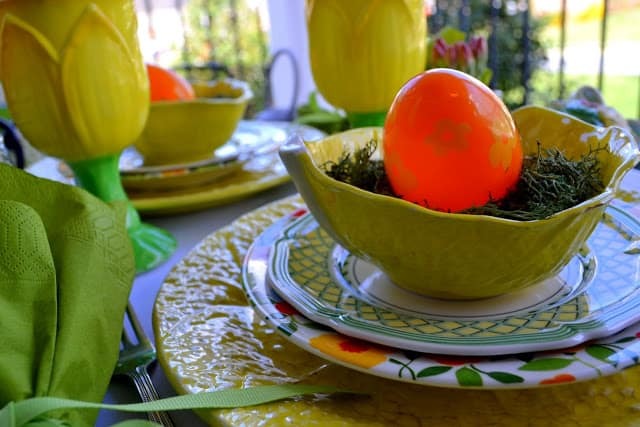 This tablescape was inspired by these Spode salad plates that I found at Goodwill for only 69 cents each. Yep – 69 cents! I had fun pulling things from my cabinets. The only money I spent was on the salad plates. 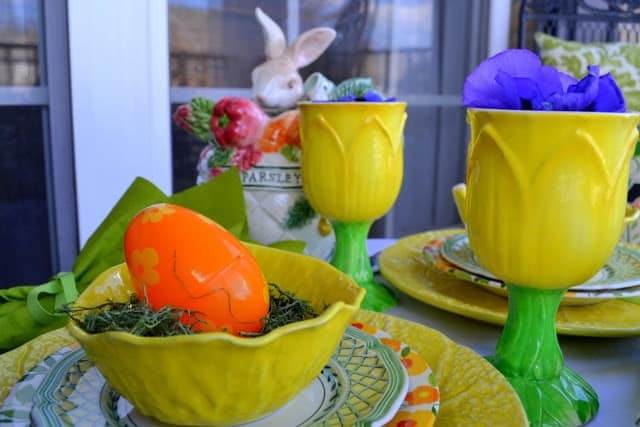 The dinner plates, bowls and tulip goblets were gifted to me by my mother many years ago. The bread and butter plates under the bowls are part of my everyday dishes. I’ll give you all of the pattern names at the end of the post. 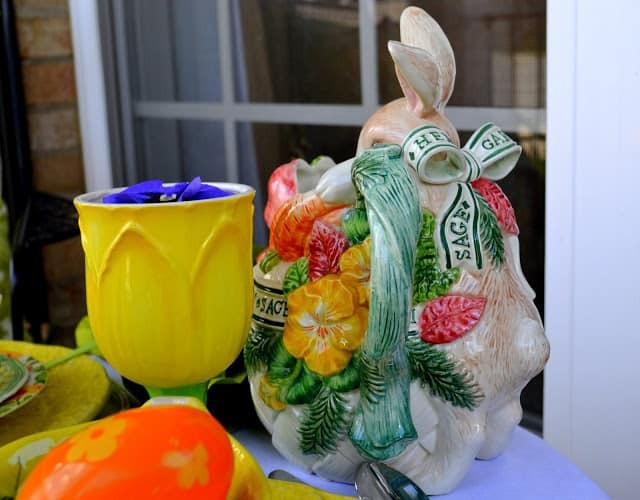 The bunny pitcher is part of Fitz and Floyd Herb Garden and is a favorite piece of mine. Lurve me some Fitz and Floyd! I think this little guy peeking into the pitcher is just the sweetest thing! 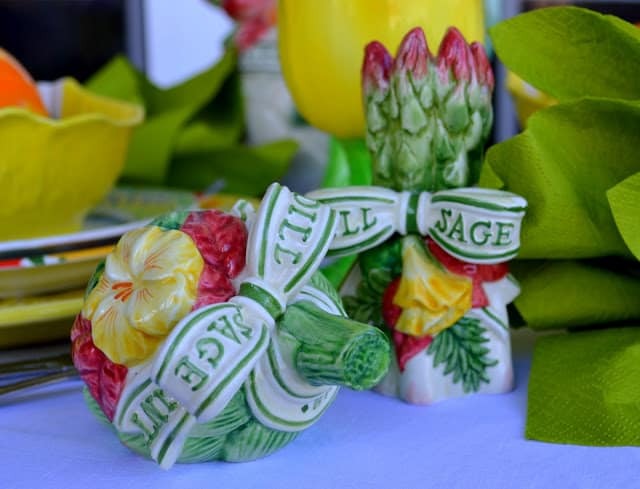 The salt and pepper shakers are two more pieces of the F&F Herb Garden collection. A place is all set for you. Won’t you come join me? Oh my gosh!! This is sooo beautiful. I love Fitz and Floyd and your pieces are lovely. I do love the bunny peeking into the pitcher. So glad the beautiful table is ready I am on my way. Hey Suzy…I need to come over and join you on the porch and enjoy that ever so adorable table…69 cents? ?..those plates are the cutest!! !…Looking forward to you joining my party….Happy Spring! 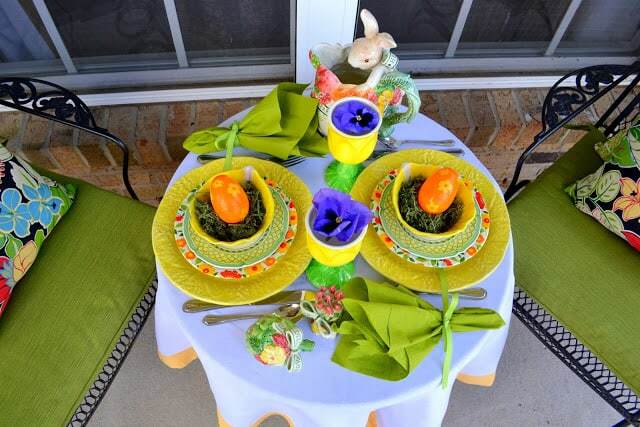 I really like this…the bunnies are adorable…those plates are ME!! and I love all the colors!!! Wow, I love these bright colors for an outdoor party! Too cute! The colors of your table are so pretty! I can’t believe you found those plates at Goodwill, they are perfect! Happy Spring and thank you for linking up at the Great Spring’tacular linky party! Love your table the colors are so pretty and I LOVE the salt and pepper shaker!!!! I’ll be right over – I’ll bring the wine! So inviting and fun! How fun…love your F & F things. Miss M and Miss K should have a tea party!! I’ll be right over to join you at your delightful table setting. Don’t you just love all the bright and cheeriness of spring? You’ve certainly made it come alive! What a delightful tableseting. 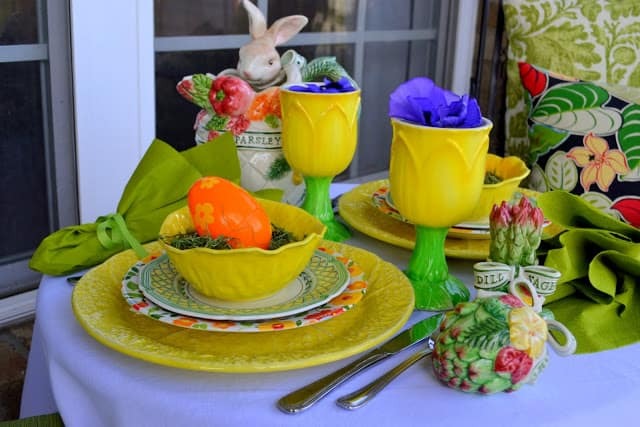 Love all of your pretty colorful dishes and the little rabbit touches are darling. What a pretty little spot, Suzy! I love your Fitz & Floyd pieces. I have a few of their bunny pieces myself. I think it would be a delightful lunch sitting at your table! Adorable! I bet your granddaughter loves it! :)Can’t wait to have lunch! Well, Suzy, this is just the cutest setting I’ve ever seen! Love the F & F pieces, especially the bunny pitcher — he is adorable! 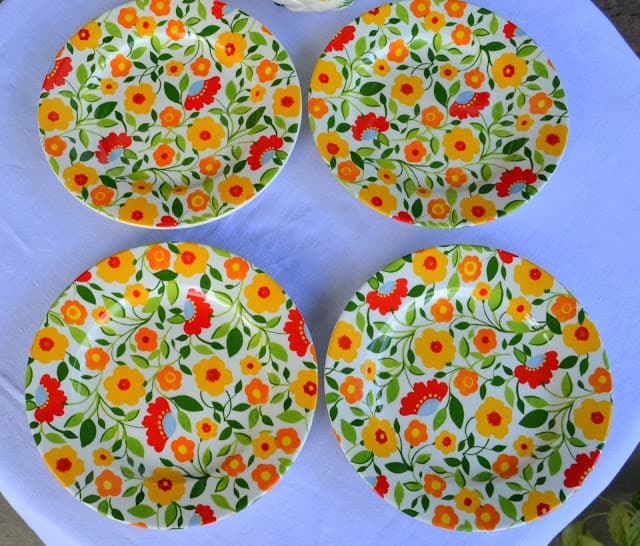 I can’t believe those salad plates you found at GW — just amazing! This Tablescape is beautiful and also delightful!! You did a lovely job putting this all together for Easter. 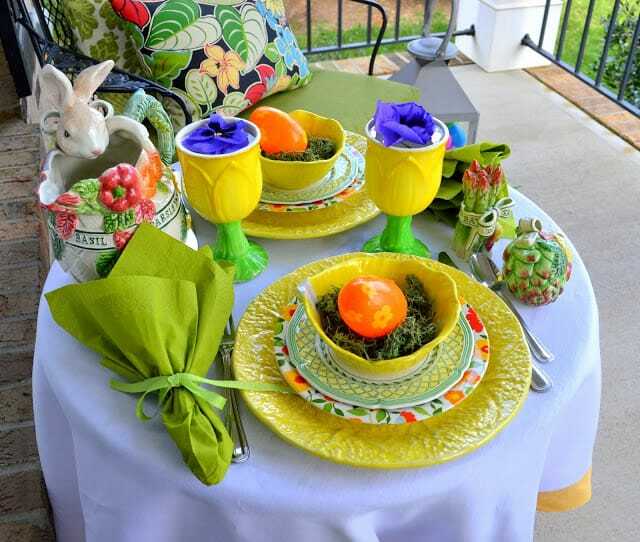 love all of your pretty colorful dishes and the little rabbit just make it pop. Thanks so much for your sweet comments on my new post. I hope you and your family have a wonderful St.Patrick’s Day. I LOVE LOVE the bright colors and salad plates are perfect. What a find! 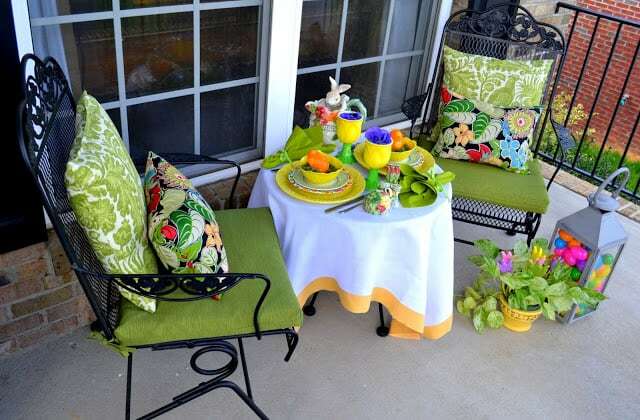 Your porch looks so cute with the table set, and without, as in the previous post. Really cute. Suzy, I just LOVE this setting! The colors are just spectacular!! You really put a gorgeous setting together! I would never want to go inside!! You ALSO do pretty tablescapes! What a beautiful, welcoming area you’ve created!! Bright, colorful and ready for Easter and Spring! Get outta town! Just 69 cents for those great salad plates??!?!??! SPODE, no less??!?!?! Amazing! Way to spot a bargain!!! This is a wonderfully colorful table! I don’t know who on earth could possibly resist it! You did a wonderful job of mixing your dishware, too! That’s not always as easy as one might think. Great job! Suzy, it’s just beautiful!! I wish I could sit there with you! I keep just looking at the pictures over and over again! What a bright fun setting. I love it! So fun and colorful! Love the plates, too! Thanks so much for sharing with us! We hope that you will join us next week! Suzy, yes, I’d love to come and join you on your beautiful porchand sit a spell!! Everything looks so cheerful and Springy!! 69 cents for Spode salad plates!!! What a cherry tablescape you put together. What really caught my eye were the tropical pillows on the chairs. Love this vibrant, colorful, full of life table! Great to have you be a part of Seasonal Sundays. Love it! So cheery and full of fresh spring color! Everything looks fantastic! I love those spring inspired pillows they’re so lovely! Thanks for sharing! I was reading the follow up from the Homework Party when I spied this post on your sidebar that I hadn’t seen before~what a bright fun table! So much to see here, I love the Easter eggs in the lantern, the pansies floating in the tulip goblets and oh my, that bunny pitcher! That is soooooo cute! I have never seen a piece of Fitz and Floyd that I didn’t love!